Foretuit analyzes your past opportunities to predict risks and provide deep visibility into your pipeline – so you close more business with less effort. 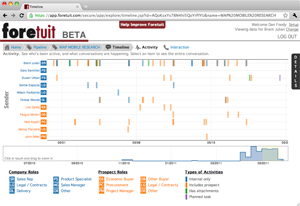 Foretuit visualizes your pipeline so you can quickly see where to focus. Foretuit's predictive engine automatically finds and highlights the opportunities that are at risk - so you never miss a beat. 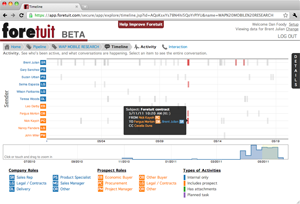 Foretuit finds and shows all activities related to your opportunity - emails, tasks, meetings, chatter, etc. - in one simple view. It's like the DNA of your sales deal. 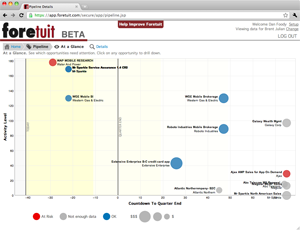 Foretuit makes it easy to find who's doing what, and what's left to do to close your deal. 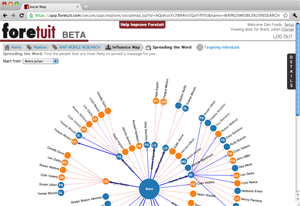 Foretuit helps you find the best way to reach key influencers in your account, and to target the best people to spread your message as broadly as possible. Foretuit combines your email, chatter, and other social feeds together with your opportunity history to create a deal DNA for every opportunity. Foretuit does this without manual data entry, so you don't waste valuable time. 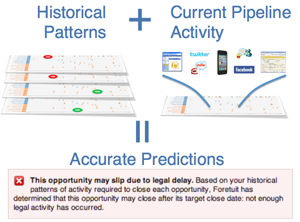 Foretuit's engine looks at every historical deal, looking for patterns that indicate the potential to win, lose, or slip a deal. 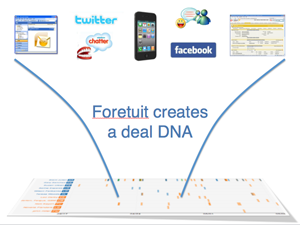 Foretuit sequences the DNA of your deals to find a unique fingerprint of the way you sell. 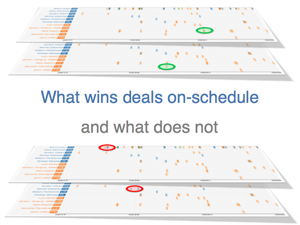 Foretuit applies the knowledge learned from historical deals to predict whether the active deals in your pipeline will be won, lost, or slip - and why. Dreamforce: Our Generation’s Summer of Love? Copyright © 2011, Foretuit Inc. All Rights Reserved.